30th Sept, 2014. Dongyu Gatsel Ling Nunnery. His Holiness the 17th Karmapa, Ogyen Trinley Dorje arrived today at Dongyu Gatsal Ling, a Drukpa Kagyu nunnery founded by Jetsunma Tenzin Palmo and under the spiritual guidance of His Eminence the 9th Khamtrul Rinpoche, Shedrup Nyima. 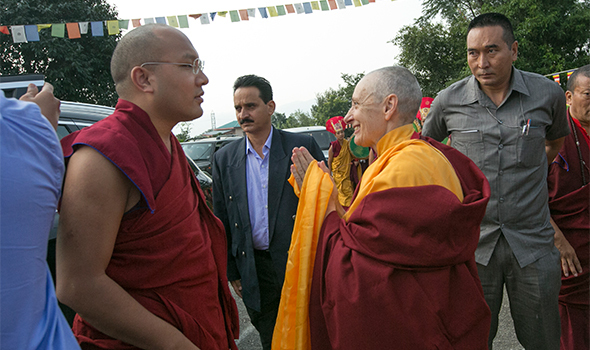 This marks the Gyalwang Karmapa’s first visit to the nunnery, where he will spend two days conferring teachings and initiation, visiting the three-year retreat centre and generally encouraging and expressing his support for the nuns. As the Karmapa arrived by road in the morning, monastic, yogic and lay members of the Khampagar community at nearby Tashi Jong lined the roads to welcome him. His Holiness was formally received at the nunnery, to the joyful sound of long horns with a ceremonial procession according to the Drukpa Kagyu tradition, with the addition of five young nuns dressed as dakinis. As an auspicious beginning to the visit, Jetsunma Tenzin Palmo, the 8th Dorzong Rinpoche and Togden Chokyi Lodro—the senior Togden yogi of the Khampagar community—offered a long-life puja (tenshug) to the 17th Gyalwang Karmapa, accompanied by 16 arhats offering prayers. His Holiness spent the remainder of the morning visiting the nuns in the nunnery’s long-retreat center, where five aspiring togdenmas are now in their sixth year of solitary retreat. Escorted into the retreat center by Jetsunma Tenzin Palmo, the Gyalwang Karmapa gave private teachings on Mahamudra to the five retreatants. He then met individually with the five aspiring togdenmas one-by-one, to offer encouragement and personal instructions. He then blessed each of their retreat cells individually, and departed for a brief tour of the remainder of the nunnery, where he blessed the various shrine rooms and library. The day’s activities resumed after a short break for lunch, as the entire nuns’ community of Dongyu Gatsal Ling was joined by the lamas and monks of the Khampagar Tashi Jong monastery and study institute (shedra) for a special practice session devoted to creating conditions for the nuns’ sangha to flourish. In an assembly led by the Karmapa, the monks and nuns together performed a practice text composed by the Gyalwang Karmapa himself for the flourishing of the nuns’ sangha. 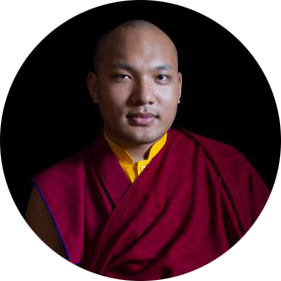 The Gyalwang Karmapa compiled the ritual drawing on texts connected to Mahaprajapati Gautami, the first woman to request and receive ordination from the Buddha. Mahaprajapati Gautami’s petition for monastic vows was supported by the intervention of Ananda, the Buddha’s attendant. Accordingly, the practice includes supplications to Ananda, based on a text by Nagarjuna in which Ananda is described as indivisible from Avalokitesvara. Upon the conclusion of this group practice, two nuns stood before the assembly and delivered formal speeches of praise and welcome to the Gyalwang Karmapa, which they had recited from memory. A succession of nuns then engaged in lively debate of philosophical topics, providing a visible display of the eloquence and confidence that is one fruit of the training they receive in the nunnery. The activities then shifted outdoors, as the courtyard of the nunnery filled with spectators for a series of sacred dances. The 8th Dorzong Rinpoche, Togden Chokyi Lodro, Jetsunma Tenzin Palmo and Nupgon Chogyal Rinpoche accompanied His Holiness the Karmapa to view the nuns performing three sacred dances: the dance of the five classes of dakinis, the sacred dance of 16 female deities and a final dance of auspiciousness. The days’ activities closed with Jetsunma Tenzin Palmo leading the Gyalwang Karmapa on a tour of the main shrine hall, where every available space is painted with sacred art. The hall’s artistic programme, designed by Lama Lodro and executed by artists from Bhutan, features an intense female presence. The walls are populated with images of female deities—including all 21 Taras—female protectors, the female disciples of Milarepa, and the bhikshunis who were direct disciples of the Buddha. As he walked through the hall slowly, His Holiness—who has read extensively about the history of the early nuns’ community—commented on the various nuns depicted on the walls of the shrine room before concluding the first day’s activities. The events of the second day include teachings and initiation and will be webcast live, with translation into English, Spanish and Chinese.